Three weeks ago, I started a feature on the main Apt528 website called "Etsy Shop of the Week." Each week, I highlight a different Etsy shop that I can't live without. Of course I forgot to share these great shops with my awesome blog readers! From now on, I'll post a link to the Shop of the Week page each Monday...now you can be as obsessed with Etsy as I am! Lovely. That's what comes to mind when browsing through Decoy Lab's Etsy shop. Every item is more beautiful than the next! 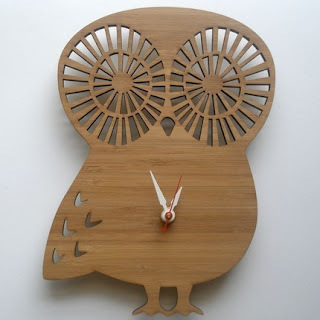 Decoy Lab's items fit into all sorts of decor, from mid-century modern (I want that owl clock!) to cottage chic. Have a little one at home? The Decoy Lab also has a line of clocks and prints designed to make your baby's nursery the best on the block! Don't forget to check out past shops Get Ready, Set, Go! and Funky Chicken Design.